According to Gartner, "No single authentication method can address the varied trust requirements associated with several local workplace use cases — including access to virtualized desktop and BYOPC environments." Gartner further adds, "More than 50% of organizations are unable to extend incumbent authentication methods to support their expanding digital workplace requirements — including access for an increasingly mobile workforce." Complete the form below to download this complimentary Gartner Research to help you select the most appropriate authentication methods for each of your systems and use cases. "IAM and security leaders should use this research to evaluate various cost-effective authentication options available for workforce local access." - Anmol Singh, Gartner, Principal Research Analyst. 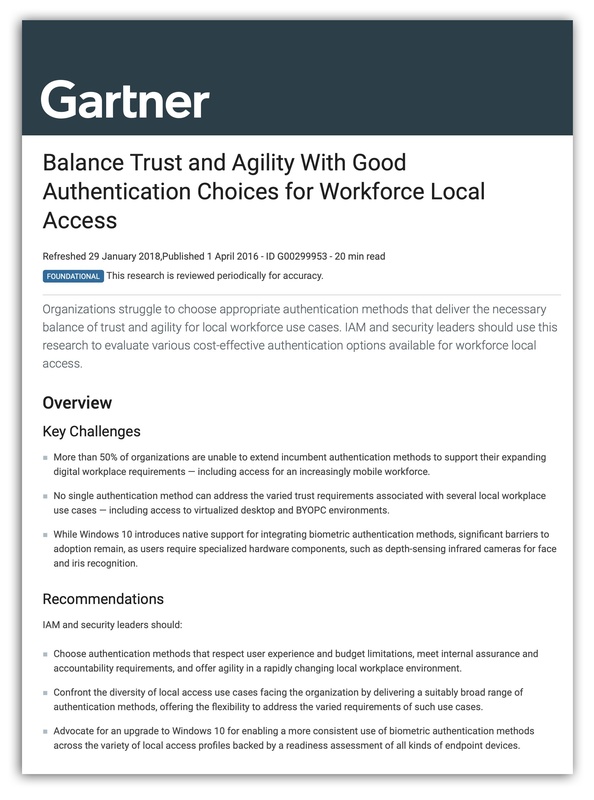 Gartner Balance Trust and Agility With Good Authentication Choices for Workforce Local Access, Anmol Singh, 29 January 2018.